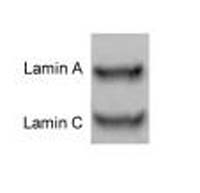 OriGene Technologies offers a full panel of antibodies to lamin A, B and C. These antibodies are suitable for various applications like immunohistochemistry, immunofluorescence or western blotting. Lamins are intermediate filament-type proteins which form major components of the nuclear lamina. Lamins form dimers through their rod domain and interact with chromatin and integral proteins of the inner nuclear membrane through binding sites located in their carboxy-terminal globular tail. Mammals have two main type lamins, A and B.
B-type lamins B1 and B2 are encoded by two distinct genes, LMNB1 and LMNB2 (Höger et al. 1990). Lamin B3 is a germ cell specific protein generated by differential splicing and alternative polyadenylation of the LMNB2 gene (Furukawa et al. 1993). B-type lamins undergo a series of modifications, such as farnesylation and phosphorylation. Increased phosphorylation of the lamins occurs before envelope disintegration and probably plays a role in regulating lamin associations. A-type lamins A and C are derived by differential splicing and alternative poly-adenylation from one gene, the LMNA gene. Mutations in LMNA have been shown to cause a whole range of human disorders, including autosomal dominant and recessive forms of Emery-Dreifuss muscular dystrophy (EDMD2/3), Limb-Girdle muscular dystrophy (LGMD1B), dilated cardiomyopathy (conduction-system disease, CMD1A), familial autosomal domi-nant partial lipodystrophy (Dunnigan variety, FPLD), autosomal recessive Charcot-Marie-Tooth disease (CMT2B1), mandibuloacral dysplasia (MAD), Hutchinson-Gilford progeria syndrome (HGPS), lipoatrophy with diabetes, hepatic steatosis, hypertrophic cardiomyopathy and leukomelanodermic papules (LDHPC), Werner syndrome (WRN) and cardiocutaneous progeria syndrome (CCPS). 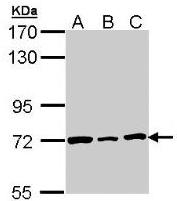 Lamin A is a 664 amino acid protein with a molecular weight of 70 kDa (calculated 74,139 Da) and a pI of 7.0 (theoretical pI 7.4). Lamin A consists of a central rod domain flanked by hydrophobic N- and C-terminal domains. After farnesylation at the CAAX-box motif, the 18 most C-terminal amino acids of lamin A are removed by proteolytic cleavage to generate the mature lamin A protein (Hennekes et al. 1994). Lamin C (572 amino acids) differs from lamin A after amino acid 566, containing an alternative 6 amino acid C-terminal end (VSGSRR).